I’m all kinds of proud of myself at the moment. 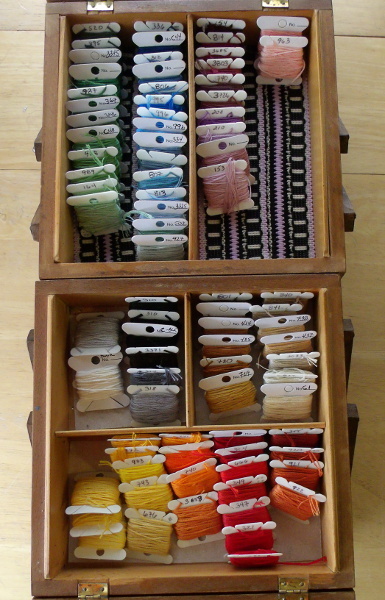 Since I’ve been doing more embroidery, I kept thinking I should really, really organize the floss. Some of it was nice and neat on little bobbins, and some was in skeins. Some was in the box where I store my embroidery stuff, some was in a coffee can, some was stuffed in the with the fabric. Some of it was a tangled mess — a while back I got a bunch of floss in with an auction lot, I think with one of the sewing machines, maybe? It was the same lot that q-snap frame I’m using for this project came in. Anyway, there were quite a few nice colors in that lot, but it was pretty radically disorganized. Over the past few evenings while watching the first two seasons of Portlandia on Netflix, I got it all organized and wound onto bobbins, with duplicate skeins stashed underneath in one of the lower sections. This makes me incredibly happy to look at. Spectrumrific! Let’s not talk about what the rest of my office/craft room looks like at the moment. When I took the frame off to shift the fabric around, I was pretty alarmed. This is the first time I’ve used a q-snap frame, and I’ve been finding it really great for keeping tension on the fabric — hoops tend to loosen up on me constantly. (Maybe I’m just afraid to tighten it down too much?) Anyway, the stitching on the forehead that was under the top clamp is pretty squished. I honestly don’t know if this happens with hoops, since I’ve never actually stitched anything that was bigger than my biggest hoop. But I was a little freaked out at first. I found a discussion on a cross-stitch forum that reassured me, though — a couple of people mentioned that the stitches plump up again when the project is washed. I also have a sneaking suspicion that I may have cut the fabric a bit small for a 14″x14″ pillow. I think I cut it at 14½ inches, which would only give me a quarter inch seam allowance, slighly less when you count the tiny bit of fraying from handling the project. If that turns out to be the case, I can either make it a 12″x12″ pillow, though I’d rather not, or I can maybe try finishing the raw edges inside with bias binding to keep it from fraying too badly? I wouldn’t be so worried if it wasn’t something that’ll have to be washed sooner or later, though if I hand-wash it that would probably keep the fraying to a minimum, too. Fingers crossed that it all works out okay in the end! PS: I have the motor to the Singer 15-91 mostly back together, just waiting for new grease wicks to come in the mail so I can install those, fill the grease cups and get everything put back together again. I’m so excited about getting it finished! 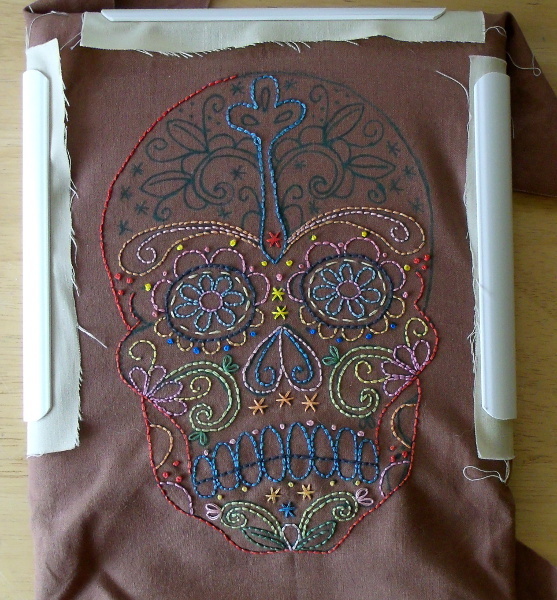 Of course, then my excuse for procrastinating on that quilt block that’s got me so unnerved will be gone, too.